If you are getting married and love to travel then here are some ideas so you can make your dream travel wedding a reality. You both love to travel. You’ve seen the world together and now you want to share your experiences with your friends and family. So why not incorporate your love of travel into your wedding? There are many things you can do to make your wedding unique and memorable with a travel themed wedding. Below are some ideas to help you get started. Design your own save the date postcards. Choose a picture of you and your husband-to-be or wife-to-be from a place you’ve traveled together. Or choose a few different pictures and share your memories with your guests. You may want to print a template for each save the date, but on the back of the postcards you can handwrite the names and addresses of your guests to make it more authentic. You could also design a stamp with something significant to the two of you, like a picture of yourselves or a place or symbol that’s special to you. Another good way to incorporate travel into your wedding is to make your invitations in the form of either boarding passes or passports. Guests will love this unique idea. 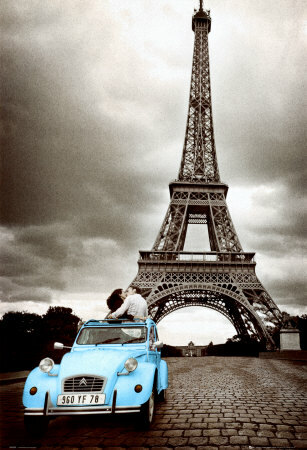 If you choose to have passport invitations, the inside picture can be of you and your partner taken in a faraway land. If you opt for the boarding pass idea, the seat numbers could be your wedding date. Instead of table numbers at the reception, try naming each table after a city or country that you like or that the two of you have traveled to together. For example, instead of “Table One” or “Table Two”, you could have “London”, “Paris”, or “Alaska”. Next to the table name, you could even have a picture of the place or one with the both of you taken there. You always take a suitcase when traveling, so why not take a suitcase to the wedding? 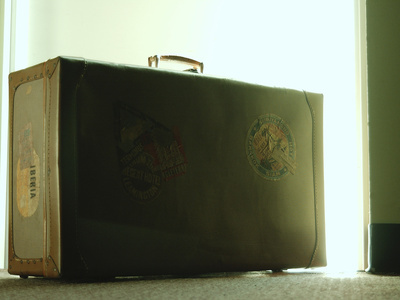 A vintage suitcase makes a great place for guests to put their wedding cards to you in. You can have it opened next to the table names or another table designated to gifts. Other items you can decorate the table with are flags or a world globe. 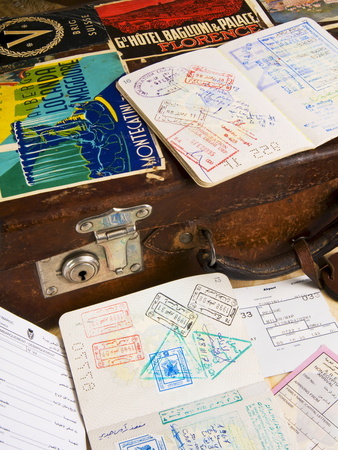 Instead of displaying a standard guest book, try having your guests write messages in a travel journal. Not only will it add to your travel theme, but guests will have a chance to write something more personal than just signing their name. And you’ll have the messages to look back to for years to come. Just make sure you leave a sign out next to the journal so guests know what it’s meant for and that they are welcome to write as much as they want. If you want to go all out on your travel themed wedding, what better way than to make it a destination wedding? 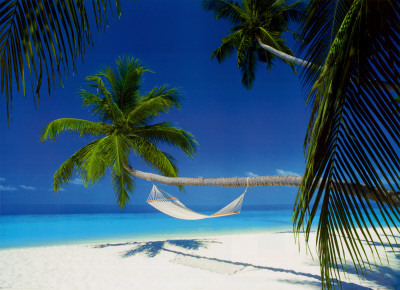 Then you can add your honeymoon right onto the end of the wedding in an exotic location. Another benefit of a destination wedding is that they can be a lot more low key and less stress than a typical wedding. However, just be prepared that a beloved family member or friend may not be able to come all that way to share your special day. 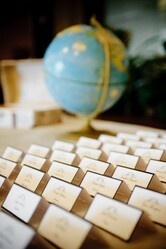 Little touches such as travel themed table names and invitations add a bit more personality to your wedding day. Your guests will love the thought and attention to detail you have put into the occasion.